Lauren Scharhag: Because what says 'holidays' like dragons and trolls? 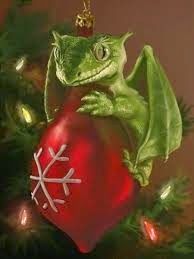 Because what says 'holidays' like dragons and trolls? I confess, I am one of those terrible people who doesn't mind when stores start putting out their holiday displays and neighbors start stringing up lights the day after Halloween. I also like to listen to Christmas carols year-round. Feel free to throw things. But this translates to good news for you guys-- I've put my holiday books on sale. The Ice Dragon and The Winter Prince are now just 99 cents, from now through New Year's Day! If you love fantasy and fairy tales, you will love these winter stories, and of course, they're great to read to your little ones. Buy The Ice Dragon: Amazon, Smashwords, or Createspace. Read an excerpt here. Buy The Winter Prince: Amazon, Smashwords, or Createspace. Read an excerpt here. Happy Thanksgiving! Merry Christmas! Happy Hanukkah! Happy Kwaanza! Happy Festivus! Blessed Winter Solstice! Happy-any-holiday-that-I-missed!